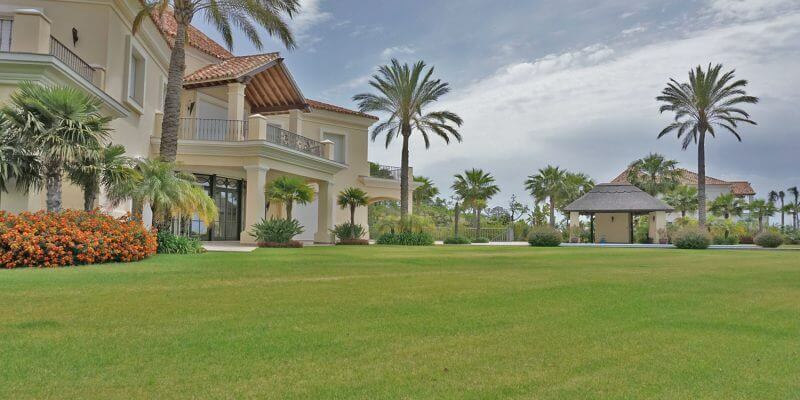 Villa Sotogrande, the place surrounded by dream landscapes is still one of the great hotspots on the Costa del Sol. Generously designed access roads, each with a 12m green corridor on both sides, the most famous golf courses (Valderrama – Ryders Cup was held here), and the discreet sports harbor complete the picture. In Sotogrande can only buy who is also becoming participant of the golf courses (Real Club de Golf Sotogrande or Valderrama), who can pay the high monthly expenses of the administration. We were able to build several houses in Sotogrande, this was finished in 2007. It has a subtle Andalusian – Californian style, large window elements and an almost 100 m2 infinity pool. The building owner had a particularly high demand for living comfort. This resulted in a dream villa with dream qualities, a heated wooden floor, linear air-conditioning openings in the rooms avoid the appearance of undesired air draughts, and the high-tech kitchen would make even the best chefs envious.